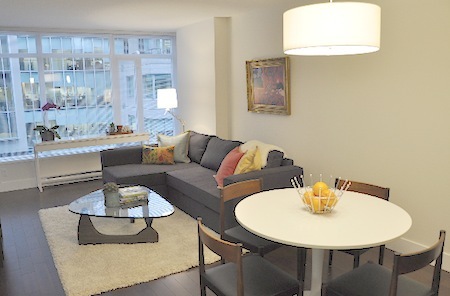 Located in the centre of downtown Vancouver's major cultural section and at the gateway to the fashionable Yaletown district is the brand new Bee Suite on Homer. If the itinerary includes sports, theatre, concerts or the opera, you'll be a walking distance of 5 minutes or less from some of the big shows going on in the city. Access major event centres like the Orpheum, the Centre for Performing Arts, Queen Elizabeth Theatre, Rogers Arena and of course, the newly renovated BC Place stadium, all by foot. 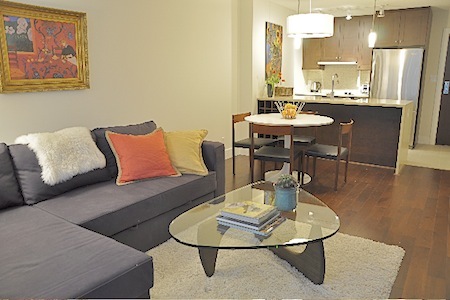 The Bee Suite is a 600 square foot, fully furnished single bedroom condo in a brand new residential tower. Amenities include a well equipped fitness facility, a patio terrace, a conference room, a lounge/party room with a full kitchen, pool table and large screen TVs. 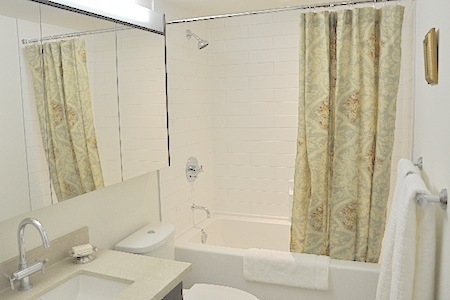 The Bee Suite itself is a stylish pied-a-terre with all the basics covered, including wireless internet, high definition flat screen TV, full kitchen with stainless steel appliances, washer/dryer, latex-free queen sized bed, full height soaker bathtub/shower, pull out sofa bed, a balcony and secured parking. 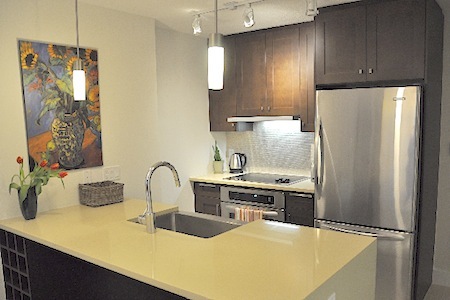 The Bee Suite on Homer has the advantage of being in the heart of it all. There are galleries, boutiques, cafes, bars, clubs and restaurants, saturating your immediate surroundings in all directions. Shopping is a right turn out the front door, just grab a coffee and you make your way up Robson Street and the major shopping district. Robson becomes your main corridor to the rest of downtown Vancouver, whether it's the stadium at one end or Stanley Park at the other. Look for the nightlife of Granville Street or go further up to find the upscale shops on Burrard Street, find them all via Robson. Want to tone it down? Take a left out the front door and follow Homer Street to the quaint and stylish surroundings of Yaletown, carry on to the Seawall and the marina on False Creek. 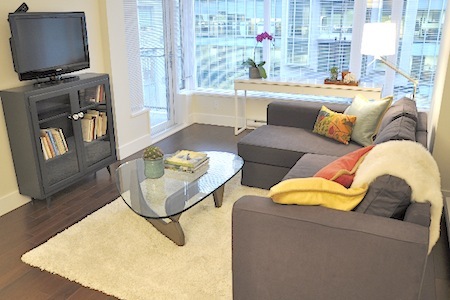 The Bee Suite is the perfect starting point for all downtown Vancouver has to offer. We had a excellent time in Vancouver and our accommodation helped a lot for this. Special thanks for Simone and Isabel, they are lovable and competent. The localization is wonderful, and the apartment very beautiful. Certainly, I'll recommend EMR to my friends who will go to Vancouver. It is a first class condo and we enjoyed our stay very much. We will consider coming back not next year but the year after. The only negative comment is with the lock on the bath room door. I told the greeter about that. Should have a device in the unit to unlock the door. Only happened once but it should be addressed for future guests. Thanks. 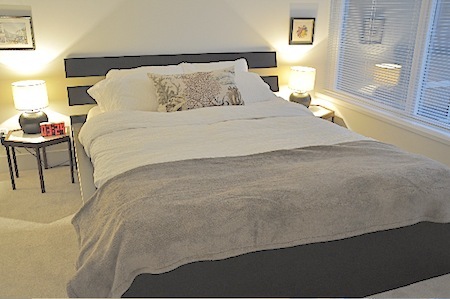 4. a better matress - we are Europeans and therefore we had big problems with the bed it was too soft.